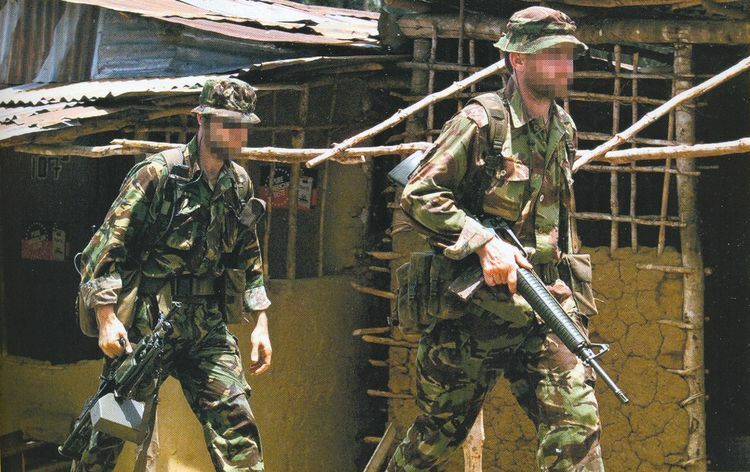 The seizure of 11 members of the Royal Irish Regiment and their accompanying Sierra Leonean Army Liaison Officer could have turned the whole situation on its head. Instead after a period of negotiation in which half the hostages were released by the West Side Boys the remainder were released in a dramatic assault by British Special Forces accompanied by elements of the 1 PARA. The operation was fraught with danger and required the Prime Minister Blair to accept the potential loss of a significant number of personnel if one or more of the Chinook helicopters were shot down with upwards of 60 SAS personnel on board. Instead, it proved to be a turning point in the whole campaign even though the RUF, which had been the main focus for the British forces, was not involved, as well as sending a wider signal about Britain’s commitment both to its forces and to Africa in general. The Royal Irish Regiment replaced the 2nd Battalion, Royal Anglians in the STTT role and within a few weeks found themselves with 11 of their personnel taken hostage. Their roulement with the Royal Anglians had occurred without any major problems; the Royal Anglians were needed back in the United Kingdom to prepare for their forthcoming deployment to Northern Ireland and the Royal Irish were the next duty general light infantry battalion. Like the Royal Anglians their deployment of some 200 personnel consisted of a training team plus a defence force based around their C Company.4 At the same time, other assets in country were steadily reduced. The Chinook force had departed after the rescue at Kailahun in July and the Special Forces contingent also largely withdrew, which meant that they had less back-up than their predecessors but this was not perceived to be a problem. It was generally assumed that the RUF would not return to offensive operations until November when the rains would have stopped and there was a window of time to bring as much of the SLA through the STTT process as possible. Drugged, drunk and dangerous, the West Side Boys have created an extra layer of chaos in war-torn Sierra Leone since their renegade militia broke with President Kabbah’s besieged government three months ago. The 30-strong force believed to be responsible for the capture of 11 British soldiers is renowned for youthful brutality and swaggering confidence. They are fortified by a seemingly infinite supply of so-called ‘morale boosters’, sachets of gin or vodka that are gulped down on an empty stomach to help them keep fighting, and are clad in a ragtag uniform of boots, T-shirts, baggy jeans and wraparound sunglasses. They had been led by Johnny Paul Koroma, the head of the 1997 coup, who by September 2000 was a colleague of President Kabbah. Koroma had decided to back Kabbah in May and the WSB had been one of the militias that had initially supported the government against the RUF. The WSB therefore had links to the government but as Koroma had decided to base himself in Freetown he was replaced as leader of the WSB by the self-style Brigadier-General Kallay. Kallay was a defector from the RUF but retained some loose links to the RUF that were never entirely clear and would provide a source of concern for the hostage negotiators. Under Kallay, the WSB had drifted away from Koroma and the Sierra Leone government and they had ignored a subsequent Sierra Leone Government ultimatum to enter the DDR process and disarm. Instead, they chose to set up a base in a collection of huts at a village called Gberi Bana on Rokel Creek, a fast-flowing river near the Occra Hills. From here they terrorised the local community extorting from them for their various needs. The relative calm was disturbed however by unforeseen events. On Friday 25 August 11 members of the Royal Irish Regiment and an accompanying Sierra Leone Army liaison officer were sent out on a routine patrol to visit the Jordanian UNAMSIL battalion based some 60 miles east of Freetown. The patrol was based on three Landrovers, one equipped with a heavy machine gun, and led by the company commander, 9 They were told by the Jordanians that the local villages were no longer in the hands of the West Side Boys who had apparently vacated the area. The company commander therefore decided that this was an opportunity that should be exploited and that it would be a good move to talk to the locals to start to get a feel for the area in preparation for UNAMSIL taking control. On arriving at the village of Magbeni the patrol was overwhelmed by at least 25 heavily armed West Side Boys whose armament included a Bedford lorry equipped with an antiaircraft gun. Instead of starting a firefight the company commander sensibly decided to avoid confrontation and the patrol was seized and taken prisoner. The manner of their capture was to cause considerable embarrassment in Whitehall, because of the earlier British criticism of the capture of UNAMSIL personnel in May, and the Company Commander was subjected to a Board of Inquiry. The Royal Irish were rapidly moved by boat across the creek to the nearby village of Gberi Bana, the main WSB base where they would remain until freed 15 days later. As soon as it was realised that the patrol was missing back at their base at the Benguema Training Centre an intensive air and surface search began in the remaining hours of daylight. As daylight faded PJHQ was alerted and the search for the missing patrol was resumed the following morning. However, the patrol was not found and it soon became discovered that the patrol had been taken hostage by the WSB. The treatment of the hostages varied between atrocious behaviour, including beatings, mock executions and witnessing various members of the WSB abuse their other captives, to acts of friendliness. Much depended on the individuals concerned and their relative state of mind. This largely depended on the level of alcohol and drug consumed by their captors on any given day. However, in general, the British Army personnel were comparatively well treated in comparison to their Sierra Leone Army Liaison Officer and the leadership of the West Side Boys viewed them as useful bargaining counters. an able and clever man, who with the help of Metropolitan Police negotiators was able to effect a rapport with the terrorists. We in London knew that the hostage takers were impressed by his seniority and enjoyed talking to him as ‘equals’, and I’m in no doubt that he kept them as calm as possible and so bought time for a potential rescue operation. The British government also encouraged the former WSB leader, Johnny Paul Koroma, to use what influence he had with the group to obtain their release but this ultimately proved far less than was hoped. The negotiating team were soon able to make contact with the West Side Boys and talks began initially with their leader, Foday Kallay, present. The West Side Boys made a specific demand for a satellite phone and the number for the BBC World Service in return for the release of all the hostages and equipment. The telephone was provided, together with a number for the BBC World Service. A further agreement was made to provide fuel to drive the British vehicles out. Later that evening (30 August) after the agreed time had passed the Jordanian UNAMSIL battalion reported that five British hostages had been freed. They reported that all the hostages had been subjected to mental abuse, including mock executions. This partial release encouraged the view in Whitehall that progress had been made and that negotiations should continue to try and obtain the release of the remaining captives. This was viewed as the most likely avenue for success. Moreover, continuing to negotiate gave additional time to prepare military alternatives. The negotiations with the West Side Boys continued over the next few days but, significantly, their leader, Kallay, was no longer present. The local United Nations leadership learned that there was dissent within the ranks of the West Side Boys and there were doubts whether Kallay remained in command or was even still alive. The release of the five Royal Irish captives and the response of the British to this appears to have encouraged the WSB to expand their demands. These swung between safe passes to the UK to start university degrees to posts in the government of Sierra Leone and almost certainly depended upon the individual actually negotiating at a particular point in time. The 11 were too few; they were off guard; they were unprotected. They had better be rescued fast, by negotiation or by force, if the Government is not to be held culpably reckless of the safety of Britain’s Armed Forces. The character and conduct of this mission must then be re-examined. This is a matter of deep concern and our thoughts go out to the families of those who have been captured … Whatever else happens, the Government must not lack the resolve to take whatever measures are necessary to secure their release. In other words Duncan-Smith, a former Guards officer, backed the use of force to release the hostages if it proved necessary. Whilst a negotiated settlement was the preferred solution, preparations for military options were begun almost as soon as news of the Royal Irish seizure was received. Such an operation was traditionally the preserve of Britain’s Special Forces but the scale of it forced them to seek additional help from the regular army. From the beginning it was emphasised to ministers that such an operation would be an assault and not a classic rescue operation such as the 1980 Iranian Embassy siege. The size of the West Side Boys contingent estimated at 200–300 and their location spread over a number of villages with a river dividing them in half precluded such an option. Two military options were developed. The first, an emergency assault, would have been used if the lives of the hostages were thought to be at imminent risk and thus it would not have been at a time of the military’s choosing. The second option, a deliberate assault, was a planned attack aimed at freeing the hostages at a time chosen by the commander in the field. The notice to move of various units was reduced and SAS personnel were recalled from Kenya where they had been on exercise. Tragically this led to a couple of SAS personnel being killed in a car accident on their journey back to the Kenyan capital. As for the regular army, ironically, it was the A Company of 1 PARA, which had missed out on Operation Palliser, which was the Airborne Lead Company on call and they formed a major component of the hostage rescue mission – Operation Barras. Rumours about the deployment and use of the SAS began to surface quite early. 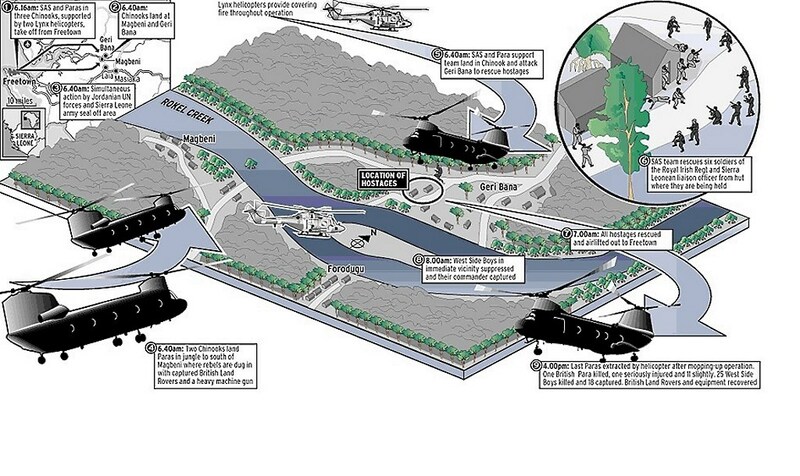 A Times report of 30 August stated that the SAS had been sent into the jungle to track down the rebel hideout. This was a little premature and soon afterwards Geoff Hoon considered proposals for a rescue operation. They were approved and the initial deployment of units commenced over the weekend of 3—4 September 2000 with reconnaissance elements deployed into the jungle a couple of days later. Given the likelihood of significant casualties the government did not want to choose the military option unless they really had no alternative both Hoon and the Prime Minister, Tony Blair, had to weigh up various risks. The deployment of forces deep into Sierra Leone might be detected, and thus lead to precipitous action by the West Side Boys against the hostages. Yet, their exact location and well-being needed to be established. If an emergency assault was necessary, time was critical especially as an emergency assault would take at least 15 hours to mount from the United Kingdom. It was therefore agreed to the deployment of the requisite forces to Senegal to shorten the response time to around six hours. At the same time the authority to launch an emergency assault was delegated to the British High Commissioner and the Commander of British Forces in Sierra Leone to further shorten the time required. The elements of 1 PARA officially became part of the rescue plan on Wednesday 30 August and they began working out their requirements to deal with the village of Magbeni which was south of the creek whilst the Special Forces would release the hostages held in Gberi Bana. The role of 1 PARA was threefold. Firstly, it would act as a diversion for the WSB who would be confronted by attacks on both sides of the river simultaneously, Secondly, it would prevent the WSB forces south of the river interfering with the rescue of the prisoners north of the river. Thirdly, by engaging directly with the West Side Boys 1 PARA was to severely reduce their capabilities and thus limit their actions in the future. The 1 PARA elements were based on a reinforced company group (A Company) with extra battalion assets including sniper teams, the Patrols Platoon, heavy machine gun sections and a mortar section. The inclusion of these assets was made to maximise the options of its commander and the firepower that could be deployed to help offset the numerical advantage of the WSB as it was acknowledged that there could be no back-up forces should the company become pinned down. Some of the members of the company had only joined it a few weeks before from basic training and there was some discussion about replacing these inexperienced soldiers. However, it was decided that as they had passed training replacing them would have a negative effect on the individuals concerned and the company. A Company moved on Saturday 2 September to the OMC and then to Dakar where their training began from Sunday onwards. The forces were held at Dakar to avoid detection and thus not encourage the WSB to take any precipitous action against the hostages. It did mean that they were still a few hours away from the WSB camp should an immediate response be required and this would involved spending a number of hours in a cramped Chinook before the mission began if an emergency assault was suddenly required. Other preparations for a deliberate assault were taken in parallel. This included getting three Chinook to self-deploy initially to Dakar and also to bring forward the deployment of RFA Argus from the United Kingdom so that she could be diverted to Sierra Leone if needed. It was hoped that she could be just off the Sierra Leone coast by the following weekend and thus available as an alternative base for the Chinooks closer to the WSB base but out of view from the land. She also embarked the equipment for a field medical unit to provide increased medical facilities to support an assault should it be needed. Further meetings and discussions by radio with the West Side Boys occurred and in one radio discussion a demand for supplies was made and some were given. However, little substantive progress was made over the weekend and on Monday 4 September approval was given by the Defence Secretary for the forward deployment of the leading elements of the Task Force to Sierra Leone, although it was decided that the Chinook helicopters should remain at Dakar. This meant that the rescue force could be picked up by the Chinooks on the way rather than for the troops to be sat in the helicopters for a number of hours prior to an assault. The Chinooks were held back because it was felt that the deployment of the soldiers could be hidden but if the helicopters were seen, which was likely, the West Side Boys would take this to be a sign of imminent British action and act against the hostages. At this stage it was believed that the balance of risk favoured accepting a longer reaction time rather than cause a precipitous West Side Boys response. Negotiations continued on 6 September. However, Kallay was still missing and those West Side Boys involved seemed increasingly unpredictable. In discussion with the negotiating team on 6 September the officer in charge of the patrol sounded tired and demoralised indicating that the mood in the village where they were being held was bad. However, the negotiations were continued and a portable generator was handed over. The West Side Boys even indicated that the negotiating team could expect good news on Thursday 7 September and the next 24 hours were identified by the negotiating team as important in determining whether the West Side Boys were serious about further releases. It fell into two parts: Operation Barras, the rescue, and Operation Amble, which aimed to involve the local SLA on the periphery, in order to give them some credit for the apparent outcome and to demonstrate the effectiveness of the British training to any other not-so-innocent bystanders. We would strike at dawn. The Chinooks would suppress known enemy billets on their approach, and their door gunners would take down the 12.7mm heavy machine guns as they landed on the football pitch. SAS teams already in place would provide covering fire. Simultaneously, Lynx helicopters from the Special Forces detachment would strafe the area to the south of the river, preventing use of the captured vehicles and more importantly the captured machine gun, keeping reinforcements at bay and creating an opportunity for the Para distraction force to land and assault the rebel village of Gberi Bana to the south. The main assault troops, guided from the football pitch by the observation teams already in place, would close in on the hostages and take them to safety. A four-man team would go after Kallay. We wanted him alive. A sixteen-strong troop would cover the rescue force and dispatch any West Side Boys who tried to interfere. Despite the protestations of the representative from the Prime Minister’s office it was decided that British forces would not conduct any follow-on operation (Operation Amble) but that the Sierra Leone Army should be encouraged to clear the West Side Boys from the Occra Hills as soon as possible thereafter. Kallay then returned to the negotiations with new political demands as well as for some equipment and provisions. The political demands were impossible for the British government to meet and the West Side Boys seemed keen to secure still more hostages. The view in Sierra Leone and at that day’s Whitehall meeting was that the negotiated release of the remaining hostages was most unlikely and that their lives were now in extreme danger. The commander on the ground indicated that his preferred intention was to proceed with the deliberate assault at first light on the following day – Saturday – and Ministers approved this. However, it took longer than planned to get the ground forces into position and the assault was put back by 24 hours. At first light on Sunday 10 September a deliberate assault was launched. Overwhelming force was used to achieve tactical surprise and to try and maintain a level of engagement that would paralyse any West Side Boys response, thus minimising the risk to the assault force and to the hostages. Chinook and Lynx helicopters flew in at very low altitude to achieve surprise as daylight broke. The Lynx helicopters laid down suppressive fire aided by the reconnaissance party on the ground and a government of Sierra Leone Hind attack helicopter which was added into the package at the last minute when one of the Lynx helicopters had technical problems and would not work. Two Chinooks flew directly over the location of the captives on the northern side of the river and Special Force troops disembarked by rope. The rescue team safely snatched the hostages but one of the rescue team, Bombardier Tinnion, was critically wounded. In a brilliant and highly dangerous piece of flying an RAF Chinook returned to picked him up despite a heavy fire-fight and flew him to RFA Lancelot, a naval landing ship in the port of Freetown, that was set up to act as the main casualty receiving point. However, Tinnion died before he reached the ship despite the best efforts of the medical team accompanying the assault. Meanwhile, in the operation on the south side of the river A Company of 1 PARA landed in two waves from the third Chinook south of the river to clear the village of Magbeni of West Side Boys. The aim was to neutralise the heavy weapons of the West Side Boys, recover the vehicles lost when the patrol was seized and destroy the military facilities available to the West Side Boys. Unfortunately the landing site used by the paratroopers turned out to be a swamp. As the ground was open and close to the villages the reconnaissance team had not been able to physically test the ground and had assessed it as the firmest ground available. The PARAs therefore had to wade 150 yards through chest high swamp to approach the village of Magbeni from the west. In almost a repeat of the attack on Goose Green during the Falklands Conflict one of the early casualties was the commander of the assaulting force along with most of his command team. His deputy quickly took over and completed the operation and the village was cleared of WSB, their other captives freed and the vehicles of the Royal Irish were retrieved and flown out. The operation sends a number of powerful messages. Firstly, it is a yet further demonstration of the refusal of successive British Governments to do deals with terrorists and hostage takers. Secondly, we hope the West Side Group and other rebel units in Sierra Leone will now realise the futility of continuing unlawful operations and instead accept the rule of law and the authority of the democratically elected Government of Sierra Leone. Thirdly, we hope all those who may in future consider taking similar action against UK Armed Forces will think carefully about the possible consequences and realise there is nothing to be gained by such action. Hoon neatly summed up the various constituents that the rescue was aimed at. For the government the hostage crisis was about managing risk. Issues about casualties, proportionality and the decision to use force were inextricably linked with concerns about potential winners and losers from the deliberate assault. A great deal was at risk for the British government. Its’ attitude towards ensuring that its hostages were released and the manner in which they were released sent signals to the RUF and to other groups within Sierra Leone, the African continent and globally. If the assault had indeed failed and there had been a significant loss of life then the policy of the British government towards Sierra Leone would have been forced to change and almost certainly involved the complete withdrawal of British forces. The resultant impact on the RUF, UNAMSIL and the Sierra Leone government would have been considerable. Moreover, it would have raised questions about government intervention policy three years before the invasion of Iraq in 2003. As it was the operation was a great success and had a major impact on the situation in Sierra Leone.